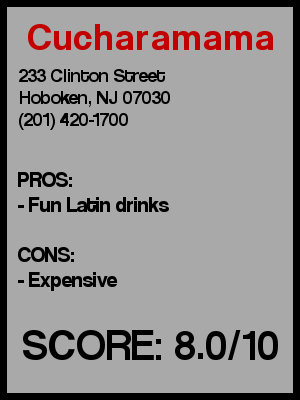 Cucharamama, one of New Jersey’s finest restaurants was next up on the Hoboken bar crawl. The South/Latin American restaurant is regularly written up in New Jersey magazines and their chef Maricel Presilla has been nominated for regional James Beard awards. Not only is their menu top notch with their wood burning oven entrees but we found their drinks to be very tasty. Cucharamama, meaning mother spoon, is located on the corner of 3rd Street and Clinton Street. That mother spoon is represented in the door handle as it is the biggest ladle that I’ve ever seen. It has a small bar that seats about 7 people. Most of the time the bar area is used for dining as there is always more demand for the food than tables available. However, on this night it was really nice outside so we grabbed a table outside for some drinks and some food. Besides your standard options, Cucharamama has a great selection of Latin American drinks. Rum and sugar figure prominently in the drink menu. I went with the “El Viejo” Ti-Punch which is basically rum on the rocks with a squeeze of lime, a little vanilla, and a cinnamon stick. I tried two- one with the Aged Barbancourt Rum and one with the 23 year old Zacapa. Other favorites on the drink menu are the mojitos, Mamapolitan, and the Mamarita which mixes Latin American flavor into traditional drinks. We were seated outside at a nice comfortable table near the front door, but having eaten inside many times I can tell you that the inside is a little noisy from the many dinner conversations. The chairs at the bar are comfy and the place is decorated in a lively colors and green foliage which contrasts nicely from the white chairs and table cloths. 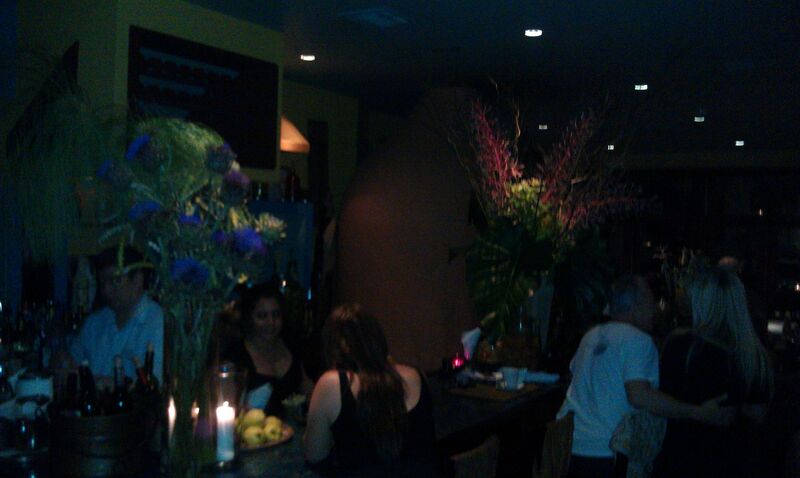 After a couple of drinks we had a nice buzz on, and then got to enjoy some tasty small plates and delicious entrees. Preconceived notion – I’ve been there many times before. It’s a great restaurant and they looked like they have a great menu. Bar Type – It’s a restaurant bar with a definite Latin/South American flavor. Crowd stereotype – Mainly couples and families. Music – We were outside so all we heard was an ambulance going to the hospital and the conversations of people walking by. Value – Drinks are definitely not cheap. My Ti-Punch was very small and while it packs a big punch it’s a little pricey. Date – Probably one of the top places to bring a date. Hookup – Maybe after a great date. First or last drink of the night – Probably good for a first drink, but it would be a shame to stop in just for a drink, since the food is so good.